Good works are no longer optional. For many businesses, success comes in unexpected ways. Toms grew into a $600 million company by giving away 35 million pair of shoes. Patagonia's profits have climbed year after year even as it funnels heavy investments into sustainability. And it's not just millennials rewarding companies with causes. In every age group, people commit to brands that show good citizenship. From CVS's destocking cigarettes to Chipotle's ethical sourcing, people want to see fair employment practices, social responsibility, and charitable giving-and they quickly call out negligence. 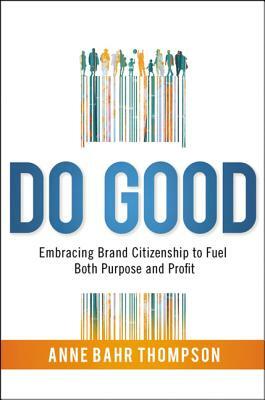 Based on extensive research with thousands of consumers, Do Good documents this sea change and explains how to embed social consciousness into a company's DNA. Packed with examples and original data, the five-step model highlights the new rules of business: * TRUST: Deliver on promises * ENRICHMENT: Make daily life easier or more inspiring * RESPONSIBILITY: Treat people and the environment with respect * COMMUNITY: Mirror values shared by customers, employees, and partners * CONTRIBUTION: Make a difference in the world. Buyers today demand more than half-hearted pledges. By actively linking great brands with higher purposes, companies capture both markets and hearts. ANNE BAHR THOMPSON is founder of the brand consultancy Onesixtyfourth and former executive director of strategy and planning at Interbrand. She has been featured in the Financial Times, The New York Times, and on Fox Business and MarketWatch Radio.